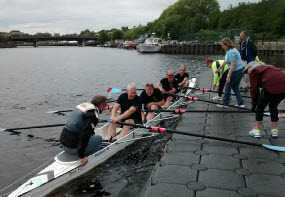 The Northern Rowing Council with the help of British Rowing set up the Explore Rowing Sunday League series in 2012. The series each year is aimed at recreational rowers, novices, recent graduates of learn to row courses and those returning to rowing. In 2015, the fourth year of the series, we kicked off on 29 March at Tyne United, Round 1 at Talkin Tarn in March having been postponed (and later run in September). Unfortunately Round 3 at Tynemouth in May was also cancelled, so eventually we ran 7 out of 8 of the events. Five events have been Splash & Dash with two lane side-by-side racing over a short sprint course; however, there were two Skills Head days, which comprised a longer time trial with water skill tests interspersed. There have been both sweep oar and sculling events. Boats: Stable coxed quads or fours provided by host club. By e-mail to British Rowing APM - james.andrews@britishrowing.org - with entry form attached - from a single club representative for all teams, please. Download the entry form here. Silver (i.e. non racing) members are allowed to have or had points. If you de-novice (sweep or sculling) at any point throughout the season you will not be allowed to take part in any further Sunday League events. If you de-novice the day prior to a Sunday League event you may still take part for that round but your team will score no points. Participants having won mixed events at regatta’s in the current season will also be asked to not take part in the League. Entries must be received no later than the Wednesday before the event. Teams may consist of 4-6 members not including coxswains for full points. You may add members throughout the season, but you must start with a minimum of 4 team members. If your team starts with 4 members you may still add 2 more throughout the season and still gain full points. Any combination of the original team members can be used in different races. Once a team member is entered and raced as one of the original 6 members they cannot be removed. You may wish to use these slots if any of the original 6 cannot attend. You have an extra 3 spaces for adding reserve members’ once you have used your 6 original team member’s slots. If these team members are used at any round you will gain ½ points for that round. Members cannot be removed from a team once they have raced. Clubs must provide enough coxswains so that all crews can take to the water when needed. Coxswains can change between races and are not included in the team of 6. Team names & crew members must be provided to ensure consistency. New teams may join at any point through the series. Members can only be in 1 team per round, however may change teams throughout the series, subject to the above rules on numbers of people in a team. Each round will be either sculling or sweep rowing in stable coxed quads or fours. Rounds shall either be Splash & Dash racing or Skill Head races. Maximum of 4 races or equal number per team over 4 hour period. There will be a maximum of 40 races at any event, which will take place over no longer than 4 hours. 1 point for each win, ½ points if any of the 3 reserves/extras are used. You are allowed to substitute team members between races. Points topped up at the end of the day and added to the league table. Roughly 1 km head races to include a selection of required skills. A course map will be provided a minimum of 2 weeks before the event. Other skills can be added when/as required. * Whole crew have their blades in their laps so the spoons are in the air. The crew rocks the boat so that the spoons on one side slap the water, then they rock the other way so the other side hits etc all whilst keeping hands/handles in their laps. Teams race twice, with the times added up to form your final time. You are allowed to substitute members between races. Points will be awarded for the top 4 placing teams. ½ points will be awarded if any of the 3 reserves/extras are used. There are no prizes or awards for individual rounds. Each year there will is a series prize and cup for both the winning Open & Women’s teams. This page last updated 07-10-15.